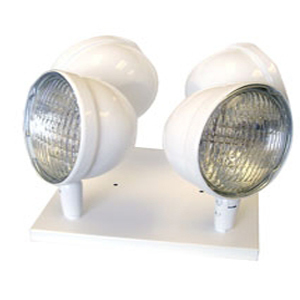 The QUAD4 is a compact unit that accommodates 4 remote adjustable fixtures. This unit is ideal for public, commercial, and industrial facilities with varied unit load requirements. Metal incandescent heads are standard. Optional plastic or weatherproof heads. Remote battery powered. Available in 6, 12 and 24 volt. Battery units have low voltage disconnects that prevents possible over-discharge of battery. Automatic brownout protection is standard. Test switch and indicator pilot light are standard. 6, 12 or 24 volt, maintenance-free, sealed lead calcium for 120V/277V system. Powder coat in architectural white. Glass-sealed PAR36 5.4 watt high-intensity tungsten lamps are standard.